The Last of Us hasn't been around for that long, but that doesn't mean we can't infect our live brains with some trivia about it. Thankfully, the keepers of bizarre factoids at "Did You Know Gaming?" are here to do just that. The Last of Us was in development for two years before the public ever learned about it. It was actually supposed to be revealed prior to the release of Uncharted 3 in 2011, but its announcement was delayed. Funnily enough, this meant that the intro segment of the latest Uncharted game contained a not-so-subtle reference to The Last of Us that ended up appearing to be very subtle because nobody understood what was meant by a stray newspaper article that Drake could find, reading: "Scientists are still struggling to understand deadly virus." Talk about a poorly timed joke! Speaking of cross-references between Naughty Dog games, the bar that Nathan Drake finds that fungus-themed article in at the beginning of Uncharted 3 appears in almost the exact same form during The Last of Us. It's called "O'Sullivan's Irish Pub," the name being a reference to Drake's close friend Victor Sullivan, aka Sullie. The way that Ellie and Joel chatter with one another while also helping each other move through hard-to-navigate parts of the world in The Last of Us is just the latest example of a unique type of character-driven gameplay that Naughty Dog popularized with its Uncharted series. Specifically, The Last of Us creators were inspired by certain passages in Uncharted 2 when the player (playing as protagonist Nathan Drake) would collaborate with his Tibetan guide Tenzin to solve puzzles and stuff like that. 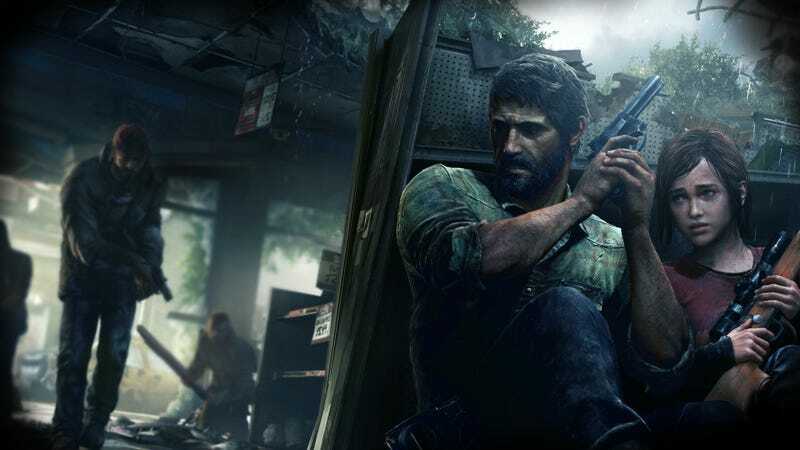 The Last of Us got its start after Naughty Dog split its development team into two separate units following the release of Uncharted 2 in 2009. The idea was that one of these units would work on the next Uncharted game, while the other focused on something else. Nobody knew what that "something else" would be at first, though. The non-Uncharted team even debated making a new Jak and Daxter game for a while, but ultimately decided against it because life is cruel and there is no god—er, I mean, because they decided that a new franchise was required to make such a big investment seem worth it. Neil and I would watch these videos where they literally use the term "zombie ants." That was our jumping-off point. When we had a concept artist do the first preliminary sketches of what it would look like, again, it was a fate worse than death. There's something beautiful and intriguing about the pictures of the fungus and how colorful and delicate it was, but then you know that this is growing through every pore of that insect. We wanted that contrast between the elegance and the delicacy versus the pure anguish, pain, and disgust of being controlled by a parasite. Other major inspirations included the movies True Grit and 28 Days Later, and comic-and-TV-series-combo The Walking Dead. Oh, and Cormac McCarthy's novel The Road, of course. Not sure why they left that one out. The developers also researched historical epidemics such as the Spanish influenza to better understand all of the unfortunate ways that humanity loses itself to senseless paranoia and militizarization during public health crises. The Last of Us has been compared to Cormac McCarthy's novel "The Road" a lot, which seems most appropriate when considering how both works make humanity out to seem like this desperate, hungry bunch of people with rare flashes of grace. Did you have any sense when you were developing the game of what vision it gives of human nature, and whether or not that's hopeful? I ask because the violence in the game took a toll on how I viewed Joel as a character. By the time he starts killing the Fireflies [a resistance group that wants to sacrifice Ellie to try to research a cure], it felt downright misanthropic. Neil: I guess that's kind of the point. The theme is: how far would you be willing to go to save your daughter? The love of a parent for a child…you can't quantify it! You can't say, "Well I'll kill five people, but not six! My kid isn't worth that much." It's illogical, it's irrational, the lengths that you will go for them. You see examples of this in real life—how much people are willing to sacrifice for their kids. At the end, [Joel] is willing to sacrifice everything. He's willing to die to save her, but more than that he's willing to sacrifice his soul to save her. He's willing to damn the rest of mankind to save her. That's how desperate to save someone he's learned to love again. I can't say whether it's hopeful or not. But it felt honest. Maybe this will sound a bit extreme, but I have a daughter. And if it came down to it, I hope I could do what Joel does. There are times when your kid is in pain, and you wish you could take that on yourself. What we were hoping to achieve with this game is give you a glimmer to feel that kind of bond through everything we threw at you. By the end, even if you disagree with him, you still get it. The character Tess was originally designed to be a villain in the main story, the idea being that she would chase after Joel and Ellie in a quest for vengeance after Joel had betrayed her. In this version of the story, Tess ultimately confronted and captured Joel, leaving Ellie to rescue him by killing Tess. Druckmann eventually decided against using Tess in this way because he felt that creating an archetypal villain character would make the game's story too generic and movie-like. Good call, if you ask me! Speaking of scrapped bad guys, the developers also left out an infected elephant which was going to chase Joel around during one section of the game. Man, now that would've been awesome. Ultimately, they decided not to make infected animals part of the game. But they still scrapped a friendly puppy companion Ellie originally had as well. Maybe the sequel will have a playable dog and a giant elephant zombie monster at least? Naughty Dog repeatedly lied about the fact that Ellie was a playable character in The Last of Us prior to its release, presumably because they hoped it would be a big surprised when players discovered that she was indeed playable. After discovering that a market research firm was planning to conduct focus group tests with only male players, the Naughty Dog developers demanded that female participants be included in the testing as well. On a similar note, the developers were encouraged to redesign the game's cover art to feature Joel more prominently and take Ellie out of the foreground of the image. Ellie's physical appearance in the game was adjusted after the game's first trailer was released to the public due to rising concerns that she looked too similar to the real-world actress Ellen Page, which she totally did. The (very slight) revisions didn't prove all that effective, however: during a Reddit AMA that took place the same month The Last of Us came out, Page threw some shade at Naughty Dog for ripping off her likeness. The two things I found most surprising about this were the scrapped monster elephant and the fact that Naughty Dog considered a new Jak and Daxter game. Please don't let that second one be lost to history! I would totally play a next-gen Jak and Daxter reboot. Watch more great "Did You Know Gaming?" videos over at its YouTube channel.